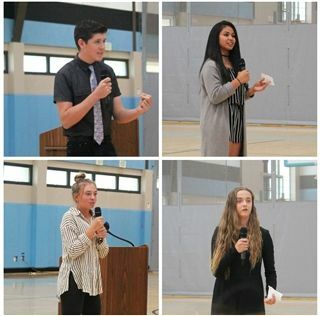 Since Pacific Ridge's founding, orations have been a signature experience for ninth graders. 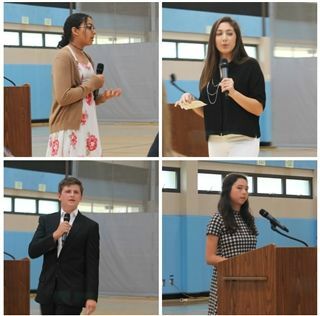 Today's orations finals included the 800th oration in the school's history given in front of the entire school community. Each finalist was selected by their peers and teachers after giving an earlier speech to a smaller audience. Topics ranged from creating success out of failure to the significance of one's name and the symbolic and gustatorial value of donuts. The speeches were often personal and were delivered with sincerity, humor and eloquence. Congratulations to the entire 9th-grade class, the finalists and third place winner Sophia Mickelson, second place winner Jackson Philion and first place winner Sofia Hart!